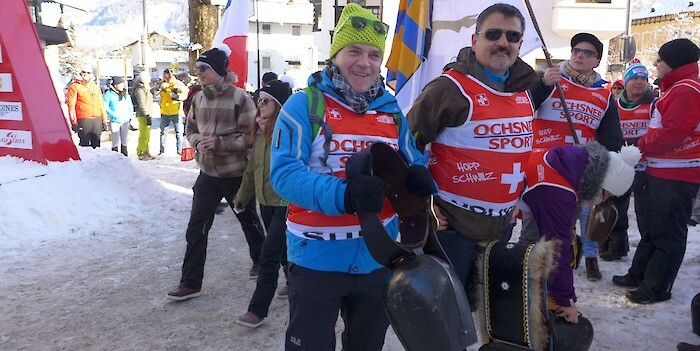 The sound of the cowbells brought by the Swiss spectators fills the air at the finish line: Ferndando Schmed's fan club (start nummer 33) has travelled specially to Kitzbühel from Sargans to bring a little "Lady Luck" to their ski racer. "We will cheer him on and hope for a good result in Kitzbühel." Eduardo Buzzi, with start number 59, is joined by his fan club who have made the journey from the Dolomites to Hahnenkamm today: "We wish him the very, very best - but we will, of course, be cheering on all the Italian athletes."